New cars on sale in 2017 emit -12.6% less carbon dioxide than the equivalent older models, but average UK new car CO2 rises 0.8%. New report finds shift away from diesel responsible for almost half of CO2 increase – with ‘disappointing’ electric car sales unable to bridge the gap. 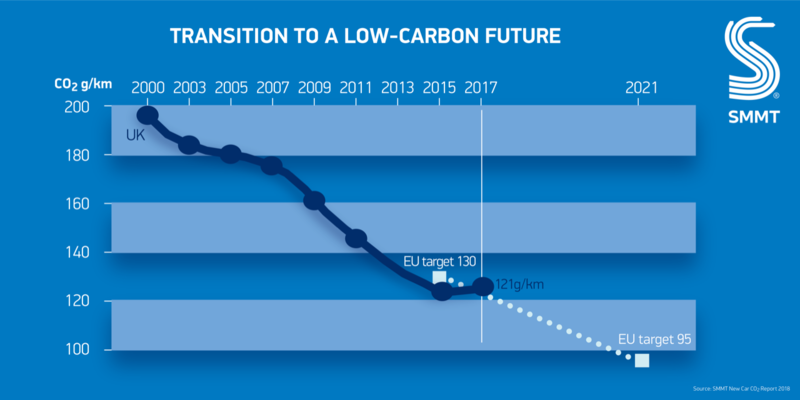 Tough EU industry targets looking increasingly challenging with -5.9% annual reduction needed to meet 95g/km level by 2021. SMMT calls for consistency from government in messages to consumers and long term incentives to deliver shared ambitions on climate change. The move came as a new report published by the Society of Motor Manufacturers and Traders (SMMT) confirmed that the fleet average CO2 of newly registered cars rose for the first time on record in 2017 – despite vehicles becoming ever more efficient. The SMMT New Car CO2 Report 2018: Driving the transition to a low carbon future reveals that carbon tailpipe emissions rose for the first time in two decades last year, by 0.8% to 121.0g/km. This despite cars being ever more efficient, with new and updated models in 2017 emitting, on average, -12.6% less CO2 than those they replaced. However, this was not enough to offset a -17.1% decline in new diesel registrations as confusion over government policy caused buyers to hold back. Because diesel cars typically consume less fuel than petrol equivalents they emit, on average, 15-20% less CO2, and about half last year’s overall CO2 rise was attributable to this decline in diesel demand. Meanwhile, a substantial fall in registrations of smaller cars also had a significant effect, as falling consumer confidence hit the lower end of the market. The increase in the fleet average new car CO2 figure follows 19 years of reductions thanks to massive investment in new, advanced engine, fuel and battery technology, as well as the use of lightweight materials such as aluminium and composites. These ongoing improvements mean average CO2 is still a third (-33.1%) lower than in 2000. The light commercial vehicle sector, 96% of which is powered by diesel, has also shown impressive progress – with new vans last year reducing CO2 by -4.8% – to a new low of 165.4g/km. The report highlights the importance of internal combustion engines in the UK’s journey to a low carbon future, with 99.5% of the UK’s 2.5 million strong new car market still powered, wholly or in part, by petrol or diesel. Alongside advances in petrol and diesel vehicle technology, which deliver lower CO2, vastly reduced NOx and almost zero particulates, industry is investing heavily in alternative technologies. More than a fifth of new car models now available are zero emission capable, yet they make up just 5% of sales. 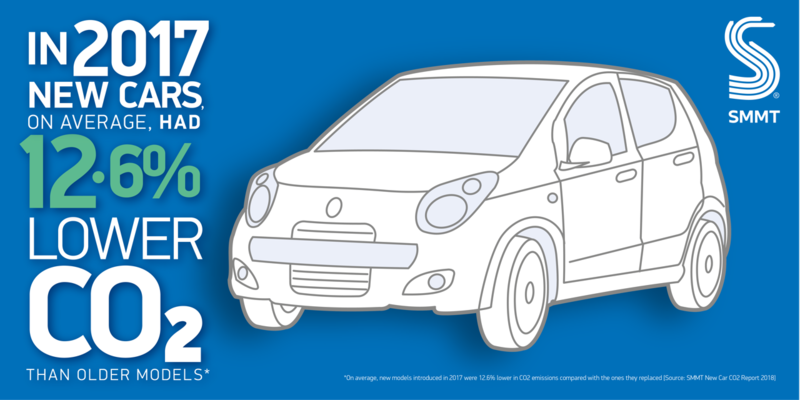 For pure battery-powered vehicles, take up is even lower (0.5%). Incentives have been scaled back and new tax measures imposed on hybrid and plug-in hybrid cars are undermining consumer and industry ambition for these technologies. Given hybrid vehicles outsell battery electric vehicles by a factor of 2.5 to 1, they will be an important part of the transition to the zero emission roads of the future. The industry shares government’s vision of a low carbon future and is investing to get us there – but we can’t do it overnight; nor can we do it alone. The anti-diesel agenda has set back progress on climate change, while electric vehicle demand remains disappointingly low amid consumer concerns around charging infrastructure availability and affordability. To accelerate fleet renewal, motorists must have the confidence to invest in the cleanest cars for their needs – however they are powered. A consistent approach to incentives and tax, and greater investment in charging infrastructure will be critical. Now, more than ever, we need a strategy that allows manufacturers time to invest, innovate and sell competitively, and which gives consumers every incentive to adapt. The SMMT UK New Car CO2 2018 report charts the UK automotive industry’s progress on new vehicle CO2 reduction over two decades, and sets out its vision for the transition to low carbon motoring. It outlines the technology advances and electrification strategies of car manufacturers selling in the UK, with many committing to offer electric models across their entire product ranges by at least 2025. The report also calls for collective action from all stakeholders, including industry, government, fuel and energy companies, to overcome fears around range anxiety, accessible charging and affordability.